The Comb is a converted traditional stone border farm situated at the head of the picturesque Tarset Valley with 60 acres of its own land. Bordered by Northumberland National Park and Kielder Forest, it sits among the beautiful scenery of one the UK’s last remaining true wilderness. 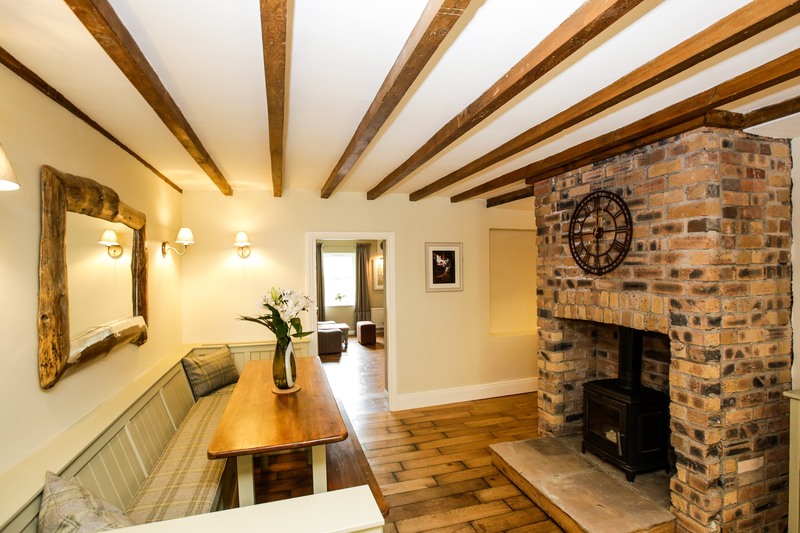 A complete refurbishment of The Comb has been undertaken to a high standard creating a beautiful building full of traditional character including original timber beams, stone walls and wooden floors. The result is something that is equally at home as base for a holiday or short break, unique wedding venue, ideal for corporate retreats and training plus a perfect venue for a party venue or other big event. The Comb has 10 bedrooms, all of which are comfortably sized with their own en-suite. They are furnished in keeping with the building with exposed beams, wooden floors and plenty of space to stretch out. The main building at the Comb is a horseshoe shape surrounding a courtyard. In the East Wing are the bar/ lounge, TV lounge and sizeable country kitchen plus snug with its cozy log burning stove as well as three bedrooms. On the ground floor with french doors to the courtyard is Black Middens bedroom and en-suite, so named after Black Middens Bastle, a border reivers historic building that borders The Comb grounds. This is suitable for wheelchair access. This is a double room with an internal staircase to a mezzenine level with two single beds, making the Black Middens room ideal for a family or couple. Above the snug are two bedrooms both en suite with doors onto the dark skies balcony. This a single, Emblehope, and double room, Turret Burn, with exposed beams in the bedrooms and bathrooms. 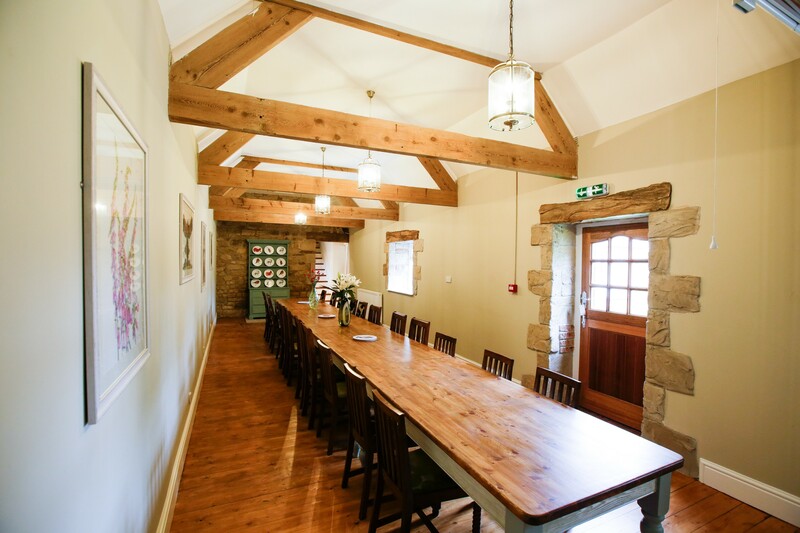 Connecting the east and west wings is the dining room with its exposed stone, wooden beams and wood floors it has a lovely ambience for an informal supper or formal banquet. It can seat up to around 36 comfortably but equally feels cozy with a much smaller number. The west wing contains bedrooms on 2 floors. Upstairs are the Tarset Burn, Dodd Loop and Corbie Castle bedrooms all named after local landmarks and all en suite. Each has stunning views with the end bedrooms having french doors to balconies to enjoy the spectacular country. On the ground floor there are the Kinmont Willie, Dunstead Sike and Highfield bedrooms which are two twins and a single room, again with en suite and views west over Sidwood and the setting sun. Finally there is the Sidwood bedroom, which is the largest. It has a large south facing balcony with great views down the valley and the en suite has a bath and a window looking west. This is accessed from the courtyard and is also suitable for wheelchair access with in-built wardrobes and plenty of space. The bar is large including a lounge offering a cozy and comfortable spot for a relaxed drink, chat or party. The dining room is ideal for either formal dining or a chilled-out supper. There is also a separate TV lounge with sofa’s and board games. The large country kitchen has full facilities including a range, dishwashers, fridge freezer, microwave and a full compliment of cooking equipment plus a walk-in larder. A large kitchen table provides for relaxed kitchen meals. The Comb is set in 60 acres of its own land which includes a mature wood and contains a clay pigeon shoot. The surrounding hills, forest and moors historically hosted the raids and fights of the Border Reivers and are ideal for exploration on foot, mountain bike or even a quad bike safari. The bar terrace is ideal for a relaxed drink or snack outside in the summer, while the courtyard and extensive lawns around the building are ideal for barbecue’s. The dark sky balcony above the bar can be accessed internally and by an external staircase is ideal for viewing the huge starlit skies at the heart of the largest dark sky park in Europe. We can also arrange torchlit suppers under the heavens or cocktails and drinks. The barn is presently being renovated to be ready for 2018 and is an ideal spot for weddings, live bands, parties and corporate events. It easily seat 250 for dining and has a licensed bar, stage and will be fitted to the same standards as the main building with a traditional barn feel in keeping with the surroundings. Large flat fields in front of the property provide a playing field for rounders, cricket, football, rugby or hitting a few golf balls before heading off to the local courses.Included with the property are a variety of facilities including table tennis, a French boule (petanque) pit, volleyball, giant Jenga and softball. The grounds are flanked on 2 sides by the Tarset and Black burns (streams) which merge at the bottom of the property before connecting to the North Tyne, the best salmon fishing river in England. Fishing can be arranged with advance notice.